Everyone, thank you for waiting. At last, it's the shop tournament finals. Which one will seize the championship laurel? Let's hope for a wonderful fight. Kai is really strong so, I think it's best to fight with all your strength from the very beginning. That's right. That Kai guy is about next in strength to the great Morikawa. Don't let your guard down. You're my disciple. Haha...if Kai hears you, I'm sure he'll be be mad. 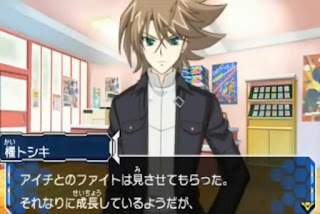 I saw your fight with Aichi. It seems you're growing in your own way, but I will confirm on this field whether or not your victory was just by chance. Picture it. Us touching down on the planet Cray, in our own forms. Let's go! "Ride the Vanguard! Burn everything in this world to ashes with your apocalyptic fire!" The match with Kai is undisputed as the hardest part of the entire shop tournament sequence. His deck is better composed than previous opponents, and he's smarter than them too. Since RTV is pre-January 1st restrictions, Kai is playing with four copies of Dragonic Overlord The End and Conroe as his first vanguard. This is a big step up from previous matches, since what Kai can do in one fight he can do in any, no strings attached. 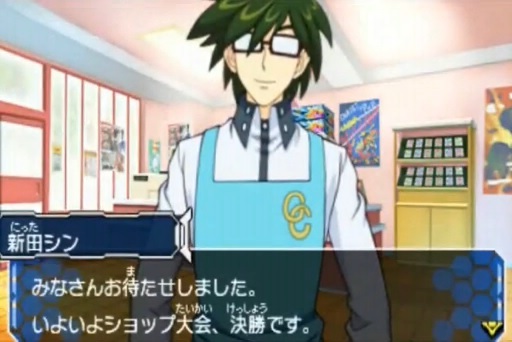 Kai's basic strategy revolves around fielding his boss card, The End. If he rides Dragonic Overlord and then The End in sequence, End's power will be at 13000 for the rest of the fight, meaning that he can shrug off the upper half of all rearguard combinations with just 5000 shield, and even if he's forced to ride The End first he'll still have an 11000 base power to fall back on. Kai can get a 21000 power vanguard line going either way, with Bahr when his crossride is active or with Flame of Promise otherwise. Both of those cards can be searched by Conroe with a simple counterblast 1. In this fight, you absolutely need to not let The End's attack hit; the reason is that if it does so, The End can counterblast 2 and persona blast to stand, which means that Kai is now getting a second twin drive and one extra card overall. Four checks all but guarantees him a trigger, so letting that attack hit can devastate you. Getting that second copy of The End in hand for the persona blast is also not difficult, because he's running Flame of Hope, whose skill lets Kai change out a card from his hand to draw another when an attack that Hope boosts, hits. So with just these five cards, Kai already has a ton of synergy going, in addition to the two critical triggers that he's running in the deck, which make him a lot more threatening than Emi or Izaki were. His draw trigger, Gattling Claw Dragon, is also one of the few of its kind that isn't a dead draw, as Kai can counterblast 1 and soulcharge it to retire one of your grade 0s, primarily a retreating first vanguard like Wingal Brave. Kimnara can do the same thing for grade 1s, and all this works back toward giving him additional turns for Flame of Promise's soulblast to make a 21000 power vanguard or rearguard Overlord. Kai's AI is pretty good about all this, too. He'll use Kimnara and Gattling Claw for cheap early attack or boosts, then use their skills afterward to get them off the field while removing your rearguards. And in addition to everything else that's going on, Kai also has access to Dragonic Overlord's counterblast 3. Overlord gets +5000 power and stands whenever its attack hits a rearguard once the counterblast is paid, which can get Kai a third drive check in the vanguard circle or provide a means of destroying your intercepts in the rearguard. This deck was professional Cardfight throughout 2012, and a lot of the difficulty associated with fighting it comes from all of the different, equally destructive moves that Kai can pull out at any given point. The best way to take this on is to accept earlier damage, then shut down Kai's attacks in the mid to lategame by destroying key rearguard lines (Burning Horn and Bahr, either Overlord and Flame of Promise etc.) while focusing your resources on stopping his vanguard. If you can maintain steady 18000 power rearguards throughout, you can negate a key part of his crossride's advantage, and wear him down gradually. Furthermore, Kai isn't running Bellicosity Dragon in this deck, so once his counterblast is exhausted it's gone for good. Note that while most fights in the game are worth 750 VP, and the semifinals were worth 850 VP, beating Kai is worth 5000 VP. You're really earning it. Hm. Not bad. 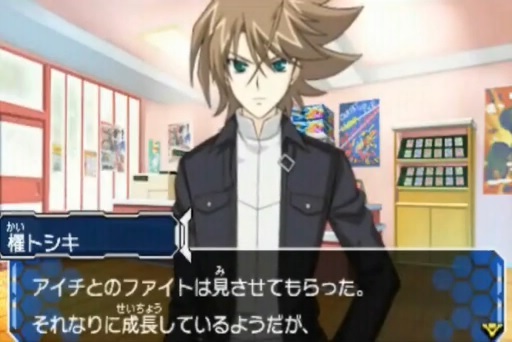 Your victory against Aichi was not just luck. You did it! Congratulations on your victory. You beat that Kai jerk! Fitting for Kamui the great's rival. This guy's really worthy of being my rival. As expected of my disciple. Well, this much is natural. Hey, if Kai hears you he'll be mad. What's wrong, Misaki? That's a depressed look you have there. That guy, I feel like he was holding back. "That guy," you mean Kai? Surely, you're just imagining things? Today I tested your ability. I'm looking forward to the next time we meet. Ah, Kai-kun. You're already going home?